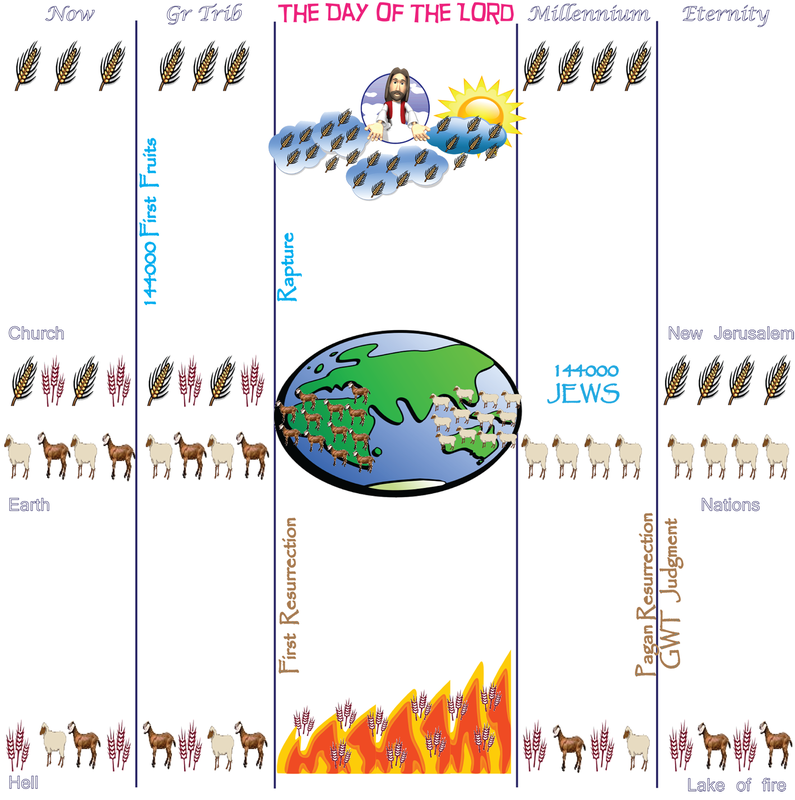 Diagram showing the three groups of people who will be on earth during the great tribulation: The Saints (Born Again believers), The Gentiles (Pagans) and the Woman (Israel). The 144000 taken from the 12 tribes of Israel are intimately related to the Woman in Revelation chapter 12. The 1260 days that the Dragon pursues the Woman (time times and half a time) is the same 1260 days that the 2 witnesses prophesy. This also corresponds to the 42 months that the saints are persecuted and the 42 months that the Gentiles trample Jerusalem. The Trumpets sound at the same time the seals are opened with the seventh seal being simultaneous with the seventh trumpet. God then pours out his wrath on the Nations who are left behind. The seven bowls of God’s wrath are poured out in the next 75 days – this is the third woe which is part of the seventh trumpet. The 144000 from the 12 tribes of Israel are also sealed and protected during this time. 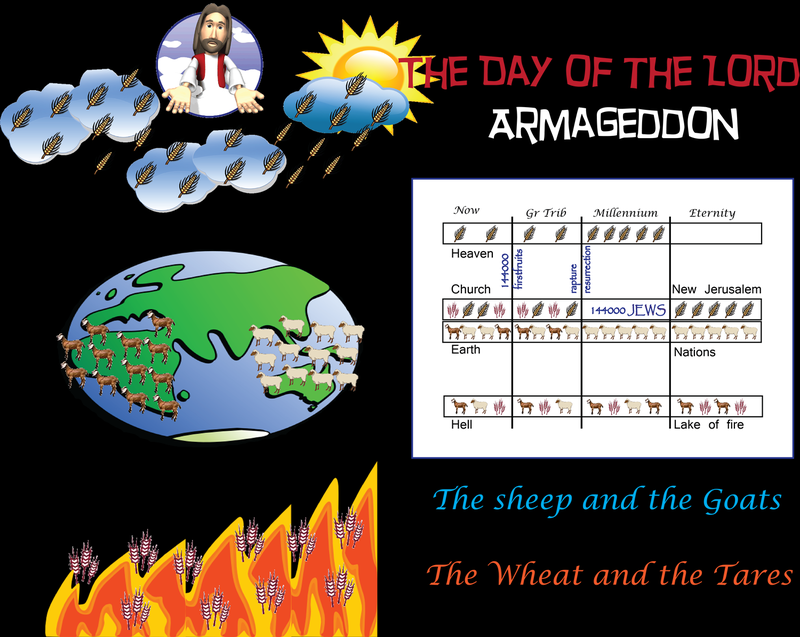 God will separate the sheep from the Goats during the 75 days that follow the rapture of the Church. As with any harvest, there will always be a few flowers or fruit that mature a bit before the majority. These are the First Fruit of the Harvest. In the Harvest at the End of the Age, there will be 144000 First Fruit Christians who are already mature before the Great Tribulation starts. As with any harvest, there will always be a few flowers or fruit that mature a bit before the majority. These are the First fruit of the Harvest. In the Harvest at the End of the Age, there will be 144000 first fruit Christians who are already mature before the Great Tribulation starts. They will be raptured to be with the Lord at the beginning of the Great Tribulation. The majority of the believers will be raptured at the end of the Great Tribulation to meet Christ in the Clouds when He comes at the Last Trumpet (Seventh Trumpet). The First resurrection and the rapture take place at the same time. As with any harvest, there will always be a few flowers or fruit that mature a bit before the majority. These are the First fruit of the Harvest. In the Harvest at the End of the Age, there will be 144000 first fruit Christians who are already mature before the Great Tribulation starts. They will be raptured to be with the Lord at the beginning of the Great Tribulation. 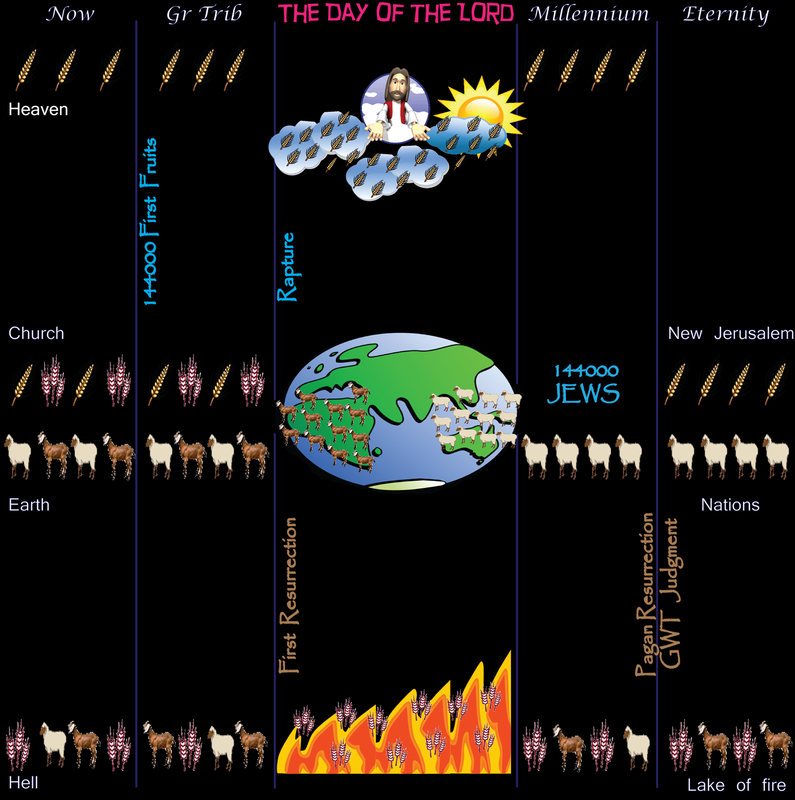 The majority of the believers will be raptured at the end of the Great Tribulation to meet Christ in the Clouds when He comes at the Last Trumpet (Seventh Trumpet). The First resurrection and the rapture take place at the same time as the coming of the Lord (Seventh Seal/Trumpet). 1Then I looked, and there before me was the Lamb, standing on Mount Zion, and with him 144,000 who had his name and his Father’s name written on their foreheads. 2And I heard a sound from heaven like the roar of rushing waters and like a loud peal of thunder. The sound I heard was like that of harpists playing their harps. 3And they sang a new song before the throne and before the four living creatures and the elders. No one could learn the song except the 144,000 who had been redeemed from the earth. 4These are those who did not defile themselves with women, for they kept themselves pure. They follow the Lamb wherever he goes. They were purchased from among men and offered as firstfruits to God and the Lamb. 5No lie was found in their mouths; they are blameless. 9A third angel followed them and said in a loud voice: “If anyone worships the beast and his image and receives his mark on the forehead or on the hand, 10he, too, will drink of the wine of God’s fury, which has been poured full strength into the cup of his wrath. He will be tormented with burning sulfur in the presence of the holy angels and of the Lamb. 11And the smoke of their torment rises for ever and ever. There is no rest day or night for those who worship the beast and his image, or for anyone who receives the mark of his name.” 12This calls for patient endurance on the part of the saints who obey God’s commandments and remain faithful to Jesus. 14I looked, and there before me was a white cloud, and seated on the cloud was one “like a son of man”a with a crown of gold on his head and a sharp sickle in his hand. 15Then another angel came out of the temple and called in a loud voice to him who was sitting on the cloud, “Take your sickle and reap, because the time to reap has come, for the harvest of the earth is ripe.” 16So he who was seated on the cloud swung his sickle over the earth, and the earth was harvested. 17Another angel came out of the temple in heaven, and he too had a sharp sickle. 18Still another angel, who had charge of the fire, came from the altar and called in a loud voice to him who had the sharp sickle, “Take your sharp sickle and gather the clusters of grapes from the earth’s vine, because its grapes are ripe.” 19The angel swung his sickle on the earth, gathered its grapes and threw them into the great winepress of God’s wrath. 20They were trampled in the winepress outside the city, and blood flowed out of the press, rising as high as the horses’ bridles for a distance of 1,600 stadia. The pagans (nations / gentiles) who are alive when Christ returns will be separated into the Sheep and the Goats after the Church has been raptured. These Sheep are not Christians. The pagans (nations / gentiles) who are alive when Christ returns will be separated into the Sheep and the Goats after the Church has been raptured. These Sheep are not Christians. These Sheep go on into the Millennium as the Nations with the 144000 Jews and repopulate the Earth. The Nations will outnumber the Jews 10:1. The Sheep Nations will never become part of the New Jerusalem but they may be allowed to enter it once a year for the Feast of the Tabernacles. The Leaves of the Tree of Life are for the Healing of the Nations. The Church gets raptured after the Tribulation but before God pours out the Bowls of his Wrath on the Nations. 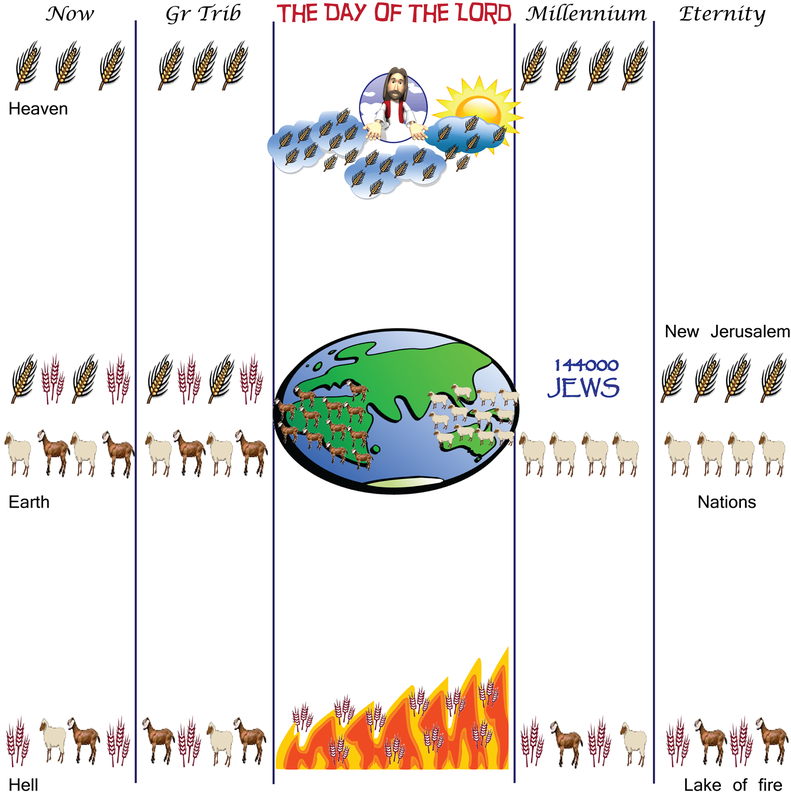 The Second Coming of Christ is at the End of the Great Tribulation, before the Millennium starts. When Christ comes at the Last Trumpet, He will raise the dead believers and rapture the Church. He will then pour out his Wrath upon the Nations of the Earth who have been left behind. He will bring an Army of believers to Strike down the Beast and the False Prophet and the Kings of the Earth. The Day of the Lord is when God Judges the Pagans who are alive when He returns. He will separate the Nations into the Sheep (who were kind to God’s people) and the Goats (who persecuted God’s people). The sheep will receive an inheritance which was prepared for them from the Beginning; namely to be the nations during the Millennium and in Eternity. The Goats will be those who accepted the Mark of the Beast and persecuted the Church. They will be thrown into the Lake of Fire. The dead outside of Christ will not be judged until the end of the Millennium when they will be raised for Judgment at the Great White Thone (A Second Resurrection – for Pagans). Those whose names are not in the Lambs book of Life will be thrown into the Lake of Fire where the beast and the false prophet were thrown. Satan will also be thrown into the Lake of Fire at this point. Born Again believers from the Old and New Covenant will then dwell together with God in a New Jerusalem. The Throne of God will be on Earth and God will live with His people. The First Resurrection and the Rapture occur at the Seventh Seal and the Seventh Trumpet but before the first Bowl. Revelations is Largely Chronological although the Rapture of the Church (the Great Multitude from every Tribe and Nation) is mentioned in several places. The Bowls are part of the Seventh Trumpet. They are the Third woe. The Bowls are for the unbelieving nations who are left on the Earth after the Church is Raptured. The Church is raptured as soon as the seventh trumpet is sounded (1Cor 15:52). The seventh trumpet signifies the end of this age and so it continues to sound until all of the Bowls of God\’s Wrath are poured out. Who is the Beast of Revelation? The seven bowls are the third woe. What happens to the Ethnos? What happens to the wise and foolish virgins on the Day of the Lord? Could Jesus come back tomorrow? Is the Lord’s Return Imminent?